Standards-Based, Platform-Independent, Entitlement Secure, Scalable, Distributed Application Resource, Rich New-Media Content, Virtual Profile, and Collaboration Portal Management, and Modeling Solutions, in High Performance Parallel Processing Streaming Content Pipelines, Integrating Distributed Application and Service Platforms like SOA/ROA/J2EE/.Net. Avoid 9/11 and access the patient medical profile with entitlement secure sharing. DNAOSintegrate entitlement secure distributed virtual profile, resource, rich content, portal management, design, modeling, and tracking, with separation of concerns interactive and print publishing in open standards-based Service Platforms. DNAOSdynamically assemble Virtual profiles and content, from any combination of distributed resources. Profiles and resources are accessed as required and authorized, so that users can access profile data as integrated documents, but only with the information segments that each is entitled to, according to context and entitlement security configurations. See also Virtual Profiles. DNAOSprovide entitlement secure distributed resource management services for virtual profile applications. The DNAOS SOA rich client graphically models content, resources, profiles, as well as entitlement to these. Entitlement and resources are visually defined, modeled, managed, queried, monitored, reported, and transformed, with relations and context. 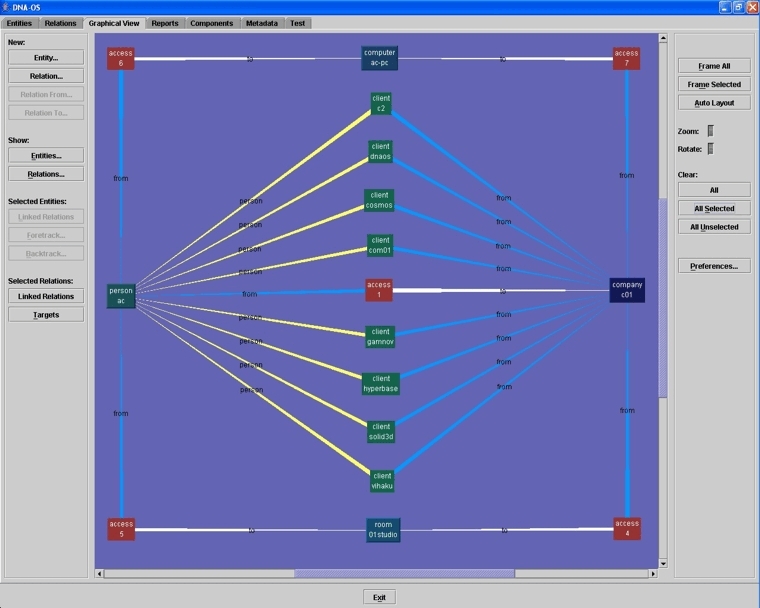 See also DNAOS SOA Modeling & Administration client. Standards-based DNAOSintegrate existing encryption, authentication, and authorization solutions, adding unlimited granularity entitlement and security configuration for distributed application resources and virtual profiles. (see Security). DNAOSallow application logic and security configurations to evolve independently, also application security checking to be offloaded from expensive application servers to dedicated systems or appliances. The SOA, WOA, ROA, XML, and standards-based DNAOS Service Platform operates on most distributed computing platforms, including J2EE, .NET, JMS, Service Bus. Apart from enabling collaboration and productivity, increased security and flexibility extends distributed application reliability, effectiveness, and life-cycle, while providing major savings, especially on maintenance costs and efforts (see Benefits). For more on DNAOS related technologies and issues, including on migration from previous or other solutions, please visit pages from links on this page's menu, the DNAOS Features section, other pages on this site, other sites on hyperbase.com, send a note to sales, or contact us.